We visited the Yashiro Japanese Garden in Olympia this week. 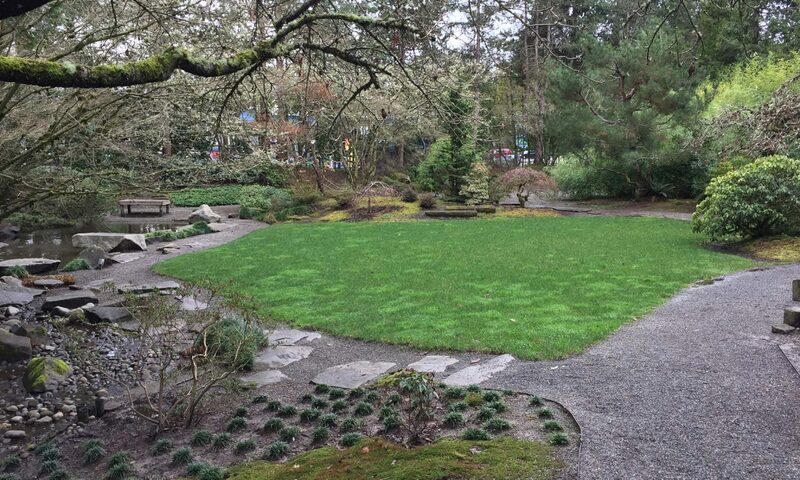 The garden was completed in 1990 as a joint project of the Olympia-Yashiro Sister City Association and the City of Olympia. It’s one of the many parks and trails maintained by the City of Olympia. It’s just under three-quarters of an acre tucked in beside the Olympia Municipal Court on Plum Street in downtown Olympia. We’ve driven past it several times and we finally arranged a time to stop and check it out. Even in early February, the park was quite beautiful and the hellebores were in bloom! Actually, a number of plants had buds and I felt like we were standing at the edge of early spring. The park is a small but tranquil oasis. Admission is free, hours are dawn to dusk. Download a park brochure and map. Nature = joy. Get outside! Today’s Weather: What a difference 5-10 degrees makes! It’s drizzly today but not cold. Makes me happy. 50°F for the morning dogwalk! 52 at about noon.